A-Designs Audio, Inc. is proud to announce the worldwide debut of its Mix Factory, a totally new concept and approach to “out-of-the-box” summing for musicians and engineers looking to get more from their current sound and workflow. Our new Mix Factory isn’t just any old summing unit, It delivers analog warmth with the depth and imaging needed to make your mixes truly stand out from the crowd. Based on a concept developed by producer/engineer/mixer Tony Shepperd and brought to life by celebrated designer Paul Wolff, A-Designs’ new Mix Factory accommodates up to 16 audio channels, which come into the device on two D-sub inputs and sum to stereo XLR outputs. All 16 channels have a continuous FDR (gain) knob, pan pot with center detent, and cut (mute) switch that acts as a signal indicator with an audio sensitive LED, which glows when signal is passing into the channel and intensifies when the signal is stronger. That same cut button illuminates red when used as a mute, and green when signal is passing through the channel. There are two eight-channel groups on the Mix Factory: 1-8 and 9-16. 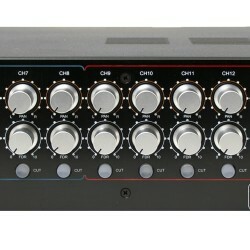 Each group has an insert for a compressor or EQ, and there is also a master insert for all 16 channels, along with three mute buttons for each Insert. The Mix Factory has a pushbutton option to go from clean—the standard setup bypassing the transformers—to tonal using the custom-made output transformers manufactured by Cinemag. The difference between using the transformers and not is night and day, giving users an option for analog tone and/or color. In situations where more than 16 channels are necessary, the Mix Factory is linkable, providing 64 or more channels… it’s like having a console in a rack! A beefy, external, switchable power supply allows the unit to be used for both 120-volt domestic (US) studio environments as well as 230-volt export markets. Including the PSU, the 2U device weighs 17 pounds. Dimensions 19" x 3.00" x 10"